We are living in a time of unprecedented scientific, technical and technological advancement, yet we are faced with critical issues that threaten our welfare, development and survival. Shaping human attitudes and behaviors towards resolving issues, restoring hope and building community within a given geographical sphere is a global challenge. It becomes particularly urgent when society at large is being driven to a state of extreme hopelessness. It is the investment in higher education sector and applied scientific research that impacts people, drives economies, sustains growth, inculcates positive changes in attitudes and ensures all round development within a society. The higher education institutions play a decisive role in leading the nations towards position of honor, prestige and strength. The depth and interdisciplinary nature of research at institutes of higher learning sparks creative, imaginative and inventive insights and offers solutions to real life problems. University of Haripur provides great platform for academician, researchers, and creative thinkers to do their best for research based dissemination of knowledge, skills and dispositions through workshops, seminars, conferences etc. Different departments and faculties organized series of academic activities as regular features. Similarly, the department of education is planned to have 1st International Conference on Challenges of Education System of Pakistan on March, 20-22, 2019. 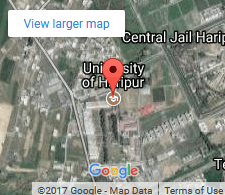 The University of Haripur currently publishes three research journals in different fields and plans to increase the numbers. We invite and welcome graduate students, scholars, faculty members and research practitioners to come and share their research and creative work addressing challenges of education in Pakistan in the form of oral presentations, poster presentations, round table discussions, panel discussions, and project in the 1st ICCEP, 2019. Conference Theme is “Challenges of Education in Pakistan” which will help us all to deliberate and ponder upon the challenges and their possible solutions. We look forward to welcoming you in Haripur, The City of Gardens.